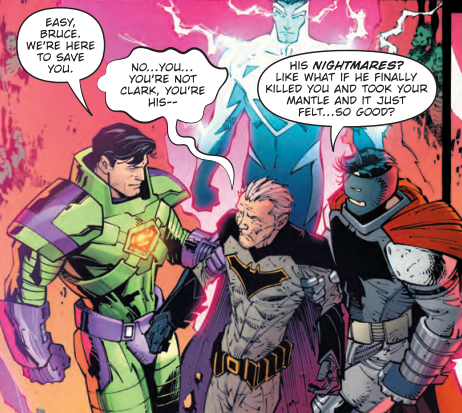 Dark Nights: Metal has more than proved itself to be not “just another Batman-centric book” – the depths that Scott Snyder and Greg Capullo plum to take advantage of the whole catalogue of DC Comics are always on full display. They show new ways to approach popular characters, as well as bringing old characters back into the forefront. However, this book was so dense – in a damn good way – that I had to double back and read it again. The first read through was almost all prose-centric; Snyder’s dialogue and pacing was so on –point that I had to see what was unfolding in the next panel, at the sacrifice of the art team’s Herculean efforts. That’s more a testament to the story than a dismissal of the art – the stakes are so high, and the dialogue so tense and frenetic that it was impossible to slow down to take in the full presentation. That’s just really good storytelling. My second time through I really got to soak in the visuals from Capullo and company, and thank God I did. Greg Capullo somehow makes people chatting for panels at a time far more engaging than it has any right to be. Take Deathstroke and Aquaman, for instance – these guys are riding around on ****ing sea horses, and Deathstroke is being a jackass, and Aquaman talks to a ****ing fish, and this is all rendered so wonderfully! I also have to give him credit in this issue, because he manages to capture a Frank Miller-esque tone in some of his characters, what with sharp edges, commanding stances, and his Superman-wearing-Dark-Knight-Returns armor (which was ****ing beautiful). Of course, without the ambiance provided by inker Jonathan Glapion and colorist FCO Plascencia, the art wouldn’t be nearly as dynamic. Glapion has a lot of detail to sharpen in this issue, with the numerous settings and the expansive usage of blacks, not to mention an elderly Bruce Wayne complete with weathered skin and scars. He keeps all this intense action organized, which really is a credit to his skill. Plascencia had just as grueling a task, but came out aces – all the different environments are really depicted as unique thanks to his artistic sensibilities. He also manages to heighten the ambiance in the panels with exquisitely chosen colors, driving up the tension or establishing just how bananas a scene is. But back to the story at hand – things have progressed to the point where each narrative is engrossing enough on their own, and yet they complement each other seamlessly, driving the story forward at a breakneck pace. I love how everything has been hurtling towards the reintroduction of Hawkman, making him a focal point in the DC universe once again, and the ending delivered a moment that was four issues in the making. Also: ONIMAR SYNN! It was fantastic to see a villain from the “Return of Hawkman” epic from Geoff Johns and David Goyer show up on Thanagar, and I’m extremely curious as to how his role will unfold in all this. Dark Nights: Metal 4 continues a strong run for the series, making good use of its allotted pages to keep introducing elements of the story. The only thing I could remotely nitpick on is that there’s not as much action as one would hope, but with all the ground it covers it’s completely excusable. And lastly, this particular issue gave voice to parts of Batman that are often drowned in darkness: Hope and Wonder. What a great gift for the holidays.